Charis SIL is a transitional serif typeface developed by SIL International based on Bitstream Charter, one of the first fonts designed for laser printers. The font offers four family members: roman, bold, italic, and bold italic. Its design goal is to "provide a single Unicode-based font family that would contain a comprehensive inventory of glyphs needed for almost any Roman- or Cyrillic-based writing system, whether used for phonetic or orthographic needs." Charis SIL supports Graphite, OpenType, and AAT technologies for advanced rendering features. Along with Doulos SIL, it is licensed under the SIL Open Font License (OFL), and can be downloaded free of charge. 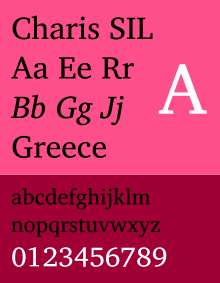 In June, 2013, version 4.114 of Charis SIL was released with over 4600 glyphs. Version 5.000 of the font was released on 28 October 2014. Phonetician John C. Wells recommends Charis SIL for displaying IPA symbols. ↑ "Charis SIL (Home Page)". ↑ "Current Versions". SIL International. 2015. Retrieved 2016-01-19. ↑ Wells, John (2012-06-04). "IPA transcription in Unicode". University College London. Retrieved 2015-07-12. Wikimedia Commons has media related to Charis SIL. Smart Unicode typefaces released under free license, Linux.com article on Charis SIL and its release as open source.